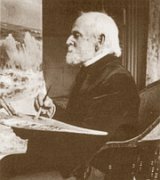 William Trost Richards was an important American landscape artist associated with both the Hudson River School and the American Pre-Raphaelite movement. Richards first public showing was part of an exhibition in New Bedford, Massachusetts, organized by artist Albert Bierstadt in 1858. In the 1870s, he produced many acclaimed watercolor views of the White Mountains, several of which are now in the collection of the Metropolitan Museum of Art. Richards exhibited at the National Academy of Design from 1861 to 1899 and at the Brooklyn Art Association from 1863 to 1885. He was elected a full member of the National Academy in 1871.Richards rejected the romanticized and stylized approach of other Hudson River painters and instead insisted on meticulous factual renderings. His views of the White Mountains are almost photographic in their realism. In later years, Richards painted almost exclusively marine watercolors. His works are featured today in many important American museums, including the National Gallery, the Smithsonian American Art Museum, the Wadsworth Atheneum, the Philadelphia Museum of Art, the Yale University Art Gallery, the High Museum of Art, the Museum of Fine Arts, Boston, the Fogg Art Museum, and the Brooklyn Museum of Art.